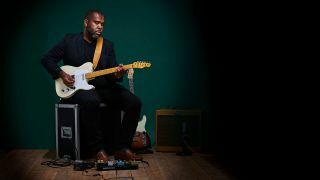 Kirk Fletcher: "Seeing Robben Ford was the thing to make me go, 'Okay, I wanna play for real…'"
This autumn saw the arrival of bluesman Kirk Fletcher’s new album, Hold On, and while he was over in the UK for some dates, he stopped by the studios to talk and also delivered a soul-shaking blues lesson. Recorded in Bristol back in January of this year, the album features Matt Brown on drums and Jonny Henderson on organ and piano. “You’ve probably heard Jonny Henderson with Matt Scofield,” Kirk continues. The album offers a great mix of soul, gospel and 60s-style R&B, with Kirk’s smooth baritone a perfect foil for his singing guitar lines. We wondered where his style originated. Besides the gospel sounds, who were your other early influences? When did you start getting into bands? “Well, the thing about church is that you’re playing in front of people immediately. The kind of church that my dad was a pastor of was Pentecostal, so it’s like whatever you’ve got - snare drum, tambourine, a guitar, a bass with a couple of strings - whatever you’ve got to make music, just do it, just play it. Nobody judges you and you just go for it. What instruments did you start out with? When did you decide to go into music professionally? Was there a watershed moment for you? Was it a bit like having a guitar lesson from Robben every night? Which of Miles’s albums did he recommend? How did you meet Joe? “I actually met Joe years and years ago in Belgium for a couple of minutes. He was just backstage at this festival and I just walked over, because I’d seen him in magazines. So I was like, ‘Hey, how you doing?’ Then I think we exchanged numbers and just stayed in touch. 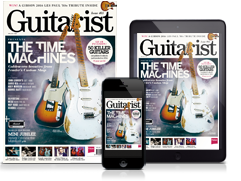 Another case of having a guitar lesson every night? What gear will you be taking out with you when you tour the new album? “I’m playing a 633 amplifier made by Cliff Brown and it’s fantastic. It’s like basically a Tweed Bassman style thing with two 12-inch Vox Gold speakers, but Cliff made it really efficient. It’s got a solid-state rectifier and it’s loud; it’s so loud and fat and warm and it just sounds amazing. So I’m using that for my main amp. Will you be touring in the UK? Kirk Fletcher’s new album, Hold On, is available now on Elaysia Records.